This Kuala Lumpur itinerary is perfect for those who like to fully immerse themselves in the culture of the places that they travel. Malaysia’s sultry capital is a melting pot of cultures and a fabulous mishmash of cosmopolitan living meets ancient traditions. Here, the city skyline is comprised of colorful Mogul-inspired domes, glittering minarets, and towering skyscrapers. One moment you could be walking along chic promenades that house mega malls and upscale eateries and the next, you are navigating through bustling street food markets shaded beneath the canopies of leafy banyan trees. Spending a few days here on a Kuala Lumpur itinerary is just enough to scratch the surface and get a feel for this vibrant city. From December 2018 to January 2019 I spent a month based in Malaysia and feel well poised to provide you with the advice to help you make the most of your Malay adventures. You don’t have to venture too far out of Kuala Lumpur’s city limits to be met with vast areas of dense jungle. It was not so long ago that the area where the Malay capital was built also resembled this. The city was formed just a few centuries back by Malay and Chinese tin miners who created Kuala Lumpur from an area of virgin jungle. The arrival of the 19th century saw the arrival of the British who colonized Malaysia and erected many grand colonial buildings that still remain today. Malaysia declared its independence in 1957 and its capital has grown and modernized rapidly since then. Today, remnants of various ages and cultures remain. Many of the highlights of Kuala Lumpur are not attractions specifically, but city districts and neighborhoods. Malaysia has a very culturally diverse population. Approximately 67% of the residents are Malay Muslim, 24% are Chinese, and 7% are Indian. The remaining percent come from “other” ethnic groups. This diversity split paves the way for sumptuous cuisines and stunning religious structures from various cultural backgrounds. This Kuala Lumpur itinerary allows you to explore the various neighborhoods and gain an insight as to how these different people truly live. Kuala Lumpur has a hot, tropical climate. It is possible to embark on a Kuala Lumpur itinerary all year round and honestly, there is no such thing as a “bad” time to go. Though Malaysia experiences a wet season with frequent downpours, the showers don’t last long and if anything, they actually cool the temperatures down to make exploring more bearable. The rainy season in Kuala Lumpur occurs during March and April, and again in September and November. The summer months between May and July are the peak times for traveling to the Malay capital, however, expect an increased amount of crowds, in addition to increased travel costs. Kuala Lumpur absolutely is a budget travel destination. It is possible to visit the city on a budget of less than $20 per day for the entirety of your Kuala Lumpur itinerary. That said, even if you prefer a little more comfort and luxury when you travel, you can enjoy all of that in Kuala Lumpur without breaking the bank. For your reference, the average costs of various items and services in Kuala Lumpur is summarised below. This Kuala Lumpur itinerary allows you to immerse yourself in the local culture, and see more than just the traditional tourist attractions in KL that everyone ventures to. Suggestions for additional days are provided at the end. If you have more/less time to dedicate to exploring KL, you can chop and change this KL travel itinerary as you prefer. Day one of this Malaysia itinerary will be spent exploring the city’s various ethnic neighbourhoods to get an insight into the cultures of the people who call this wonderful city their home. The first day of this Kuala Lumpur itinerary will start at Pasar Seni metro station. Depending on where you are staying in the city, you may need to take the metro or monorail here. Forget bland continental breakfasts or croissants with coffee, breakfast today will be enjoyed Indian style. Try to get here for around 8-9am so that you can ensure you catch a lot of the action going on in this part of town. Across from the metro station you will spot a colourful eatery with vibrantly painted walls, fresh flowers hanging from the ceiling, and punjabi rhythms echoing out to the street. This is the Vinny Jeyaa Banana Leaf curry house – one of the best in KL (I tried dozens!). A classic Indian breakfast consists of an egg roti served with tarka dal, fish curry, and a selection of curry sauces. The dish is traditionally eaten by hand and dipped into the various side sauces. Wash it all down with a cup of Adrak Wali Chai (Indian ginger tea). This is a real local place frequented by Indians residing in KL. It is generally free of tourists. The icing on the cake? The meal will cost you less than $2! Pasar Seni is a great starting point because it places you close to many of Kuala Lumpur’s main Chinese and Indian sites of importance. From Vinny Jeyaa backtrack to Jalan Sultan street and follow it around. You will pass by Pasar Karat – a worthy stopping point. A huge sprawl of graffiti on the wall demonstrates what this area is renowned for – metal working. Pasar Karat is known as the “rusty flea market” and if you pass by here before 10am, you will see old timers negotiating over various products. Is Pasar Karat a junkyard or a market? You can decide for yourself! The ramshackle stores here sell everything from electronics and jewelry items to rusty old workman tools and metal scraps. Spend a few minutes browsing the stores and taking photos, then continue on with the Kuala Lumpur itinerary. Continue following Jalan Sultan street around to Petaling Jaya. A lot of the beauty of Kuala Lumpur’s Chinatown district is in people watching and enjoying the various scenes of local life. Petaling Jaya is very touristic, but in the narrow alleys and passageways that veer off from it, you can find vendors preparing dishes by hand. The sights are so fascinating to watch that It’s like being inside a Nat Geo photo story! Vendors prepare bao (steamed buns), karipap (curry puffs) and other delicacies. In this area, you can also find some of the oldest Chinese medicine stores in the Malay capital. Whether you believe in Oriental medicines or not, a lot of these places are worth a look inside just to see the weird and wonderful things inside. Everything from tree bark to bird’s spit (!!) can be found inside the various jars and bottles. Virtually every Kuala Lumpur itinerary or travel guide will tell you to visit Chinatown’s Petaling Street or Central Market areas. While these spots are worth a quick dash through while in the neighbourhood, they are touristic and inauthentic. Expect to see heightened prices for street food and stalls overflowing with fake designer bags. 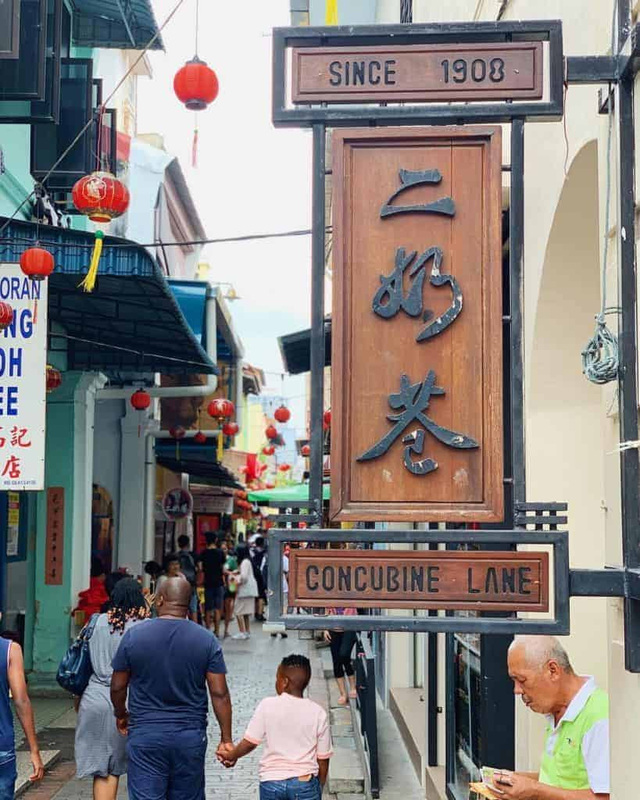 Head on to Kasturi walk and admire the neo-classical buildings that house quaint Chinese stores and restaurants as a backdrop to the flea market that fills the streets. If you want to sample the questionable durian fruit, now’s your chance! The haze of incense lingers in the air as prayer goers make their way into the Guan Di temple to pay their respects. The Guan Di temple is one of the oldest Taoist temples in Chinatown. At its centre, a huge guan dao (Chinese weapon) is the main attraction at the site. Worshippers believe that they will gain a blessing by visiting the temple and touching the weapon. It is rumored to have the ability to turn around a streak of bad luck that you may be dealing with. By this time your stomach’s probably a-grumbling so it’s time for a lunch break, Chinatown style. There are many excellent chicken and rice restaurants in the area, particularly along Jalan Sultan street. These are generally distinguishable by the string of chickens hanging in the window (the restaurants are pretty sanitary, don’t worry!). If you want to chill out for a while, there are heaps of quirky and ‘hipster’ coffee shops in this neighbourhood which is one of the reasons I fell in love with it so much! For something completely unique head to Merchant’s Lane – a former brothel turned incredibly instagrammable brunch spot. The Sri Mahamariamman temple is a Hindu Indian temple on the outskirts of Chinatown. Founded in 1873, it is actually the oldest Hindu temple in the city and was built by the same Indian pilgrim that founded the Batu Caves temple complex. The site is colourful, stunning. Visiting the Sri Mahamariamman temple is a wonderful insight into Indian culture, especially for those who have not yet visited India. A huge gopuram tower looms over the entrance filled with the colourful sculptures of Hindu gods. The temple contains shrines to Parvati (the Indian mother goddess), Ganesh and Lord Murugan. You must dress conservatively to enter (no short shorts, no cleavage or shoulders) but it’s possible to rent sarees from the both next to the entrance for less than 50 cents. Kuala Lumpur’s “Brickfields” neighbourhood is one of the oldest Indian settlements in the country. It sprawls from Jalan Travers to Jalan Tun Sambanthan. It is possible to walk from Chinatown to Little India. Alternatively, take the metro from Pasar Seni to KL Sentral Station. 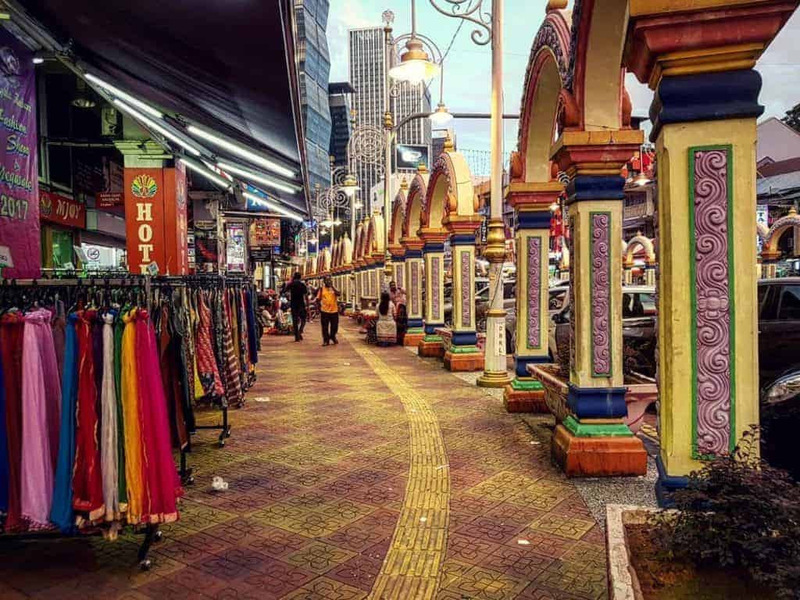 Little India is easily distinguishable from the flowers and garlands that decorate the passageways of the markets, the huge billboards with smiling Bollywood, and the stores selling spices and sarees. The Sri Kandaswamy Kovil Hindu temple and the Maha Vihara Buddhist temple are both well worth stopping by. The latter houses a reclining Buddha, almost like a smaller version of Bangkok’s Wat Pho. The highlight of Little India though is simply taking the time to get lost in the maze of streets, among the elephant statues and the stores that seemingly transport you to Mumbai. If you get hungry, head to one of the many wonderful banana leaf restaurants. Head back to Chinatown for a nightcap before bed. As a majority Muslim country, you may not expect Malaysia to have much of a nightlife scene. However the bars in Chinatown are owned by Chinese residents instead of Malays and are therefore permitted to sell alcohol. PS-150 is a local favourite, rumored to sell the best cocktails in town. For something a little different, head to The Deceased – my personal favourite and a spooky speakeasy that has a setting reminiscent of a horror movie, and a cocktail menu themed around Oriental ghost stories. After grabbing breakfast, head to Batu Caves this morning. The most convenient way to get there is by KL Komuter train. Head first to KL Sentral station and then hop on board. The journey takes approximately 30 minutes. 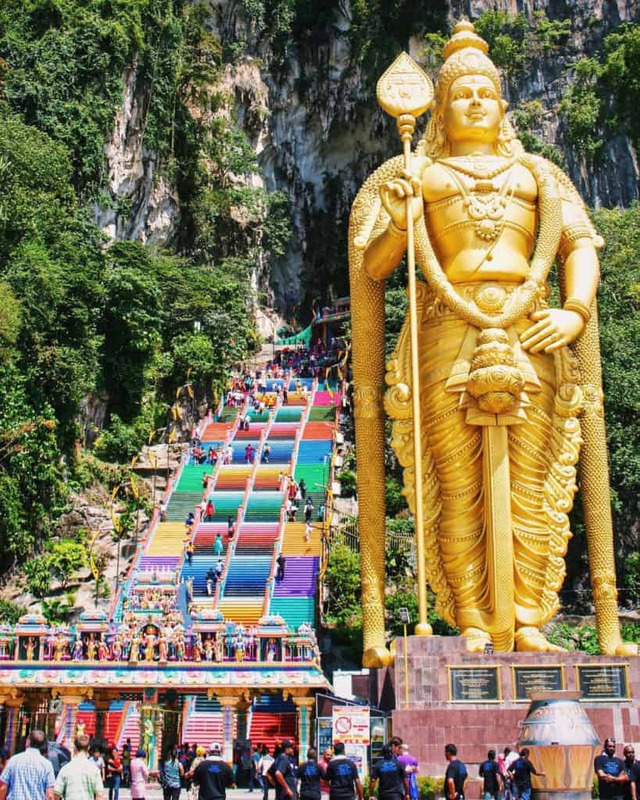 The Batu Caves are famous for the towering golden statue of Lord Murugan – Hindu God of War. He stands guard at the temple entrance. The Batu Caves complex is actually comprised of a number of various cave shrines and temples. 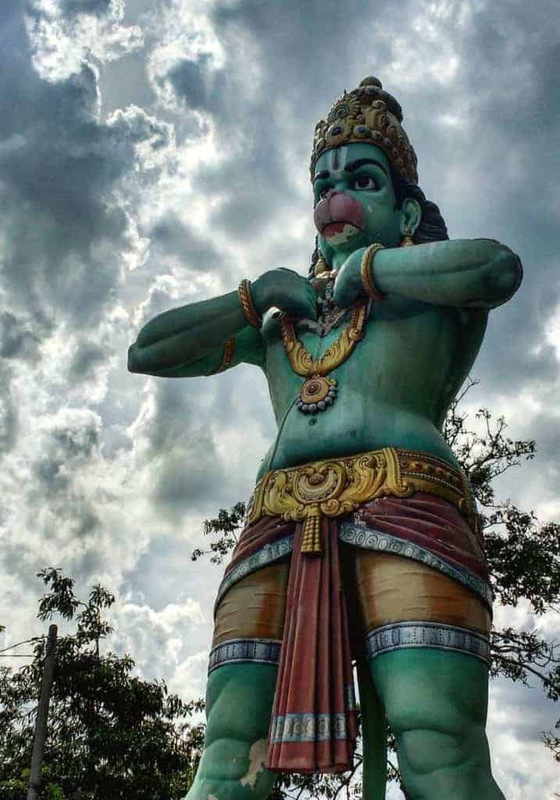 I have written a comprehensive guide on taking a day trip from Kuala Lumpur to Batu Caves here. On arrival back in KL it’s time to see the city’s most famous landmark – the Petronas Towers! The towers currently hold the title of being the tallest twin towers in the world. Regardless of how much they are photographed, they still take your breath away up close. If you want to ascend to the top floor and see the city from the viewing deck, it’s advisable to purchase tickets online or at the ticket booth in advance. Kuala Lumpur itinerary: The KLCC park adjacent to the Petronas Towers is a beautiful place to walk around or relax and enjoy the sunshine. The KLCC park adjacent to the towers is a great place for capturing photos of the structure and for strolling or relaxing by the lake. If you can be here again on the hour at 8, 9 or 10pm, there’s a wonderful light and sound water fountain show that takes place here each day. For shopping in high end and boutique stores, Bukit Bintang is your best shout. There are many ritzy, glitzy malls here, of which the KL Pavilion mall is a local favourite home to both Designer names and independent stores. It’s worthwhile to spend some time exploring Bukit Bintang on foot – especially the “Times Square” area. Foodwise there are several high rated restaurants in Bukit Bintang serving up cuisines from all corners of the globe. If you’re on a budget or prefer to rub shoulders with the locals at street food markets, head to Jalan Alor food street. This is a good spot to try all the classic Malaysian street food delicacies. Everything from beloved satay sticks to adventurous fried frog is served here. As the sun goes down, perhaps you want to unwind with a beverage or 15. (I jest… 16 sounds much better!). Bukit Bintang boasts a wide variety of nightlife options – whether you prefer a quiet mojito with a view or something a little wilder. Some of Kuala Lumpur’s best rooftop bars are situated in this area. Consider checking out the Skybar at Traders KL, Marini’s on 57, or the Heli Lounge. As far as unique experiences go, the Heli Lounge gets maximum points. As the name suggests, this bar is quite literally a helipad atop a skyscraper. There are no barriers, no walls, nothing. From up here you have incredible views across KL and out to the Petronas Towers. For wilder, more raucous partying in Bukit Bintang, head to Changkat – a narrow avenue filled with bars, clubs and restaurants that is popular with both expats and locals. Many of the bars here have frequent “Ladies Nights” where women drink for free. Putrajaya offers an interesting change of pace from central Kuala Lumpur. Reachable within just 15 minutes by a KL Komuter train from KL Sentral, Putrajaya could be considered as being an extension of the capital. It is basically the centre of Malaysia’s government, corporate and financial operations. KL was getting a little too crowded and so… Putrajaya was born! Putrajaya probably sounds a little dull so far, huh? The fascinating thing about this city is that it was not built in traditional Malaysian style, but using influences from Arabian architecture. In some ways, Putrajaya resembles a Middle Eastern city like Dubai or Muscat. Wandering around the glistening mosques, the innovative structures and the lush green tamans (gardens) of Putrajaya is a pleasant way to spend a day “off the beaten track” in Kuala Lumpur. Don’t miss the cotton candy pink Putra mosque. I have written a comprehensive guide on taking a day trip to Putrajaya here. KL Eco Park is quite literally a jungle in the middle of the city. The final day of this Kuala Lumpur itinerary is dedicated to admiring some of the city’s natural beauty. Though KL may seem like a bustling megalopolis, it is also home to various gardens and spots of beautiful scenery that are intertwined among the skyscrapers. The schedule today is a little more relaxed, to make time for any last minute shopping or so on. 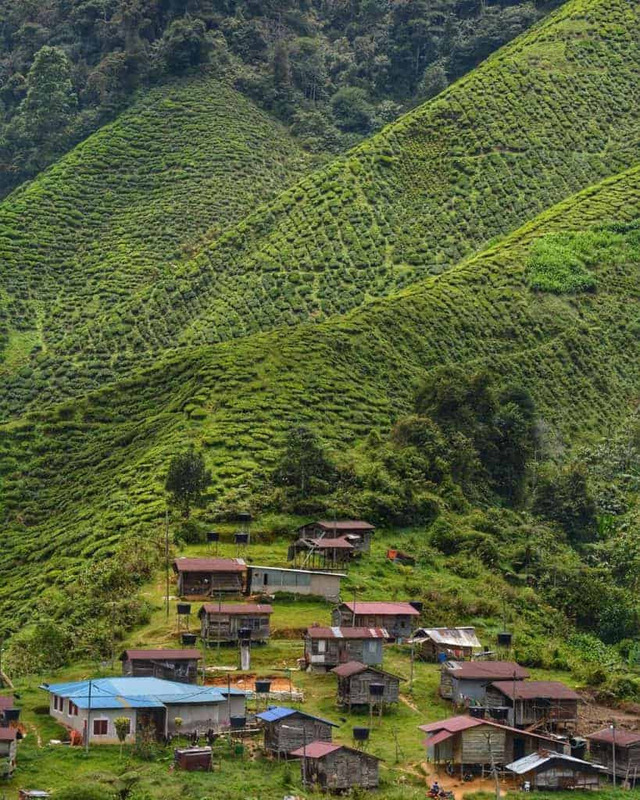 Before Kuala Lumpur was formed, this entire area comprised of rainforests and jungle. It’s hard to envisage that until you stop by the KL Forest Eco Park and wander beneath 100 year old rare Jelutong trees as endangered monkeys, birds and insect species race alongside you. For scenic views from the treetops, opt to follow the “Canopy Walk” trail. The 250 square metre Perdana Botanical Gardens are the oldest gardens in the capital. The gardens provide a calm, tropical oasis in the midst of the concrete jungle. Enjoy strolling around the lakes beneath the cover of the banyan trees. Consider packing a picnic or grabbing some street food en route before heading to the gardens for the perfect lunch spot. Closing time at the Chow Kit wet market… hold your nose! If you have never visited an Asian “wet” market, meandering through the stalls of Chow Kit will be a fascinating experience. Locals venture here each day to pick up the freshest vegetables, fruits and animal products. Arguably Chow Kit is not for the faint of heart – animal carcasses hang from the ceilings as butchers hack away ferociously, while squids and fish flail around in pails of water for their last moments on earth. A word of warning: don’t wear open toed sandals here! The stench of the meat stalls can be overwhelming, but Chow Kit is worth a visit for the experience alone. Arguably the best places to stay in Kuala Lumpur are Bukit Bintang or Chinatown. The former is more modernised, home to Michelin star restaurants, mega malls and glitzy rooftop bars. The latter consists of slightly older structures, but places you in a culturally rich area filled with excellent local eateries and quirky coffee shops. Both places are central and safe, even in the evenings. I stayed at the Melia Kuala Lumpur which I cannot recommend enough – excellent for location and service! Chow Kit also boasts many affordable hotels and accommodation options, however some of the streets here are considered Kuala Lumpur’s red light district and it is not advisable to walk around here at night. Kuala Lumpur boasts an excellent public transport network of trains, monorails and buses. Services are efficient and run frequently, with journeys costing as little as $0.25. KL traffic is notoriously bad, but if you want to take a cab, download the GRAB taxi app. It’s advisable not to hail down cabs on the street as they will often suggest you a price that is several times more than the going rate. It’s cheap and easy to get from the airport to the city ready to kick off your Kuala Lumpur itinerary. There are a couple of options for doing so, as broken down below. Taking a cab is a pretty affordable and convenient way to get from the airport into Kuala Lumpur city. Cabs that depart from KL airport operate at a fixed rate. There are no dodgy toots to contend with. It will cost you 75 ringgit (approximately $15) to get from the airport to anywhere in the city. After passing through baggage claim, you can organiseyour trip via one of the various taxi desks in the airport. Traffic dependent, it takes around 50 minutes to get into Kuala Lumpur by cab. Cabs are available from the airport 24/7. The KLIA Express is a quick way to get to and from the airport, however, it only takes you as far as KL Sentral station. From there, you will need to take a metro or a monorail onwards to your hotel. A one-way ticket on the KLIA express costs 55 ringgit (approximately $12) and a return is 80 ringgit. It’s possible to take a 10% reduction by paying via card at one of the machines, however keep in mind that your bank/credit card provider may charge a fee. The high speed KLIA Express train takes approximately 30 minutes to reach KL Sentral and free WiFi is provided on board. Trains depart from KLIA between 5.30am and 1am. The cheapest way to get into the city is to take the bus. Again, they only go as far as KL Sentral so you will need to make a connection to another train or monorail. The bus costs 10 ringgit ($2.50) per way, per person and departs every half an hour or so for KL Sentral. Bus tickets cab be purchased from Counter 3 of the KLIA Transportation Hub on the ground floor of the main terminal. From a safety perspective, Kuala Lumpur seems to have a bad rep. If you read everything that google barfs up when you search “Is Kuala Lumpur safe?” you might make yourself anxious about your Malay adventure. I travelled through Malaysia for a month as a solo female and never once felt uncomfortable or unsafe. That includes my Kuala Lumpur itinerary. As with travelling anywhere, you should exert basic common sense when travelling in Malaysia. Bag snatchings, muggings are reported as being common incidents in Kuala Lumpur. Don’t walk alone at night, don’t show off valuable jewelry/electronics and be mindful of your personal belongings in crowded areas. The Chow Kit area in particular has a bad reputation. Try not to be out here after dark. If you have a little extra time to dedicate to your Kuala Lumpur itinerary, there are plenty of wonderful places that are reachable within just a few hours journey from the capital. The charming town of Ipoh in Perak can be reached within just two hours by bus or train from Kuala Lumpur. Though you could technically conquer Ipoh in a day, it is worth staying overnight in the quaint old town so that you can enjoy wandering through the narrow streets at a leisurely pace. Lonely Planet named Ipoh as being one of the best new travel destinations in Asia. Many Malay delicacies such as white coffee and nasi ganja originated in Ipoh. As such, Ipoh is starting to rival Penang for the title of being the foodie capital of Malaysia. Next PostFear of Dengue by Mosquitos bites?